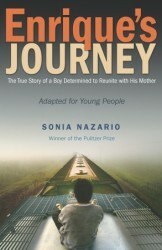 Enrique’s Journey for young adults has been adapted and updated and is aimed at middle school students and reluctant readers in high schools. There is a teaching guide available for this version, geared to the new nationwide Common Core Standards in schools, available here. It was also honored by Kirkus, one of the nation’s most prominent book review magazines, in December 2013, as one of its top teen non-fiction books, an honor given to only three other titles, and it has been picked as a 2014 Notable Social Studies Trade Books for Young People [sponsored by the Children’s Book Council and the National Council for the Social Studies]. The book was published in Spanish in July 2015.